Just because we do things differently to others, doesn’t mean we are doing it wrong. 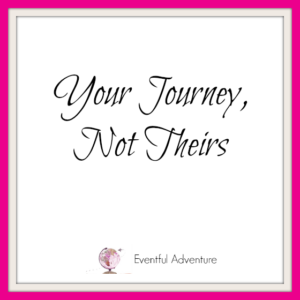 Everyone plays life cards differently, and your journey will never be the exact journey as someone else’s- and you know what, there is absolutely nothing wrong with that. I remember when I was younger I used to allow people to influence my thinking on where I should be throughout my path of life. For example, I used to think I had to be married by the time I was 21 and have 3 kids by the time I was 28. It’s not until you start your journey that you realise having unrealistic deadlines in place as to what you think you should achieve by a certain point in time, can be unhealthy because it can have a big impact on your self-esteem and self-worth. It’s always great to have goals to aspire to but make sure they are realistic, and also make sure they are what you really want- without the influences of the outside world dictating what you should be doing with your life. Being successful and having everything doesn’t define our self-worth or identity. Being positive is the catalyst for survival in life. The ability to be able to see the glass half full is the key to being happy and appreciating where you are in life. When you decide that the only person you have to please is yourself, it is empowering and motivating. It is a fantastic feeling shutting out the opinions of the outside world which is what I encourage each and every one of you do. If the only person you are competing with is yourself, you can set realistic, attainable, and rewarding goals. The act of comparison is like being an emotional cutter- don’t be violent or mean to yourself for no reason other than just because your path is different from the person’s path beside you. Be your own cheerleader. Stop comparing yourself with others and instead refocus all that energy internally and focus on how you can become the best version of you. It’s all about resisting the urge of comparing your chapter one to somebody else’s chapter 50. It’s not healthy, it’s not realistic and most importantly, it’s not relevant. Never feel ashamed or embarrassed just because you notice that someone else’s path looks better or more fun than your own path. I think people tend to forget that while someone’s path might look all fun and rosy, you don’t know what is going on inside and their own challenges they are facing. So next time you find yourself comparing to someone else, stop yourself and think whether it is fair to compare your life with theirs when you are only seeing a portion of their life they want you to see. You don’t have the full story. If comparing is how you evaluate your worth, you will always be losing, there is no doubt about it. In this game of life if your only objective is to reach a point where you are better than others in every way, well you are going to fail miserably because it will never happen. Part of what makes life awesome and interesting is learning from the lives of others. Instead of trying to be as good as or better than others, focus your energy on being the very best version of yourself. Next time you catch yourself using someone else’s life as a benchmark for your own worth, stop. Rewire your thinking and remind yourself how ineffective this strategy really is and what will you achieve if you keep thinking like that? Nothing. You’re only going to make yourself feel worse- don’t be an emotional cutter. Instead, compassionately redirect your energy and attention to your own goals and what is required to achieve them. Don’t lose focus, keep the bigger picture in mind. We don’t know how long we have on this earth, so don’t waste valuable time playing the dangerous game of making comparisons. Couldn’t agree with this more. Especially in this digital age where we are exposed to other people’s lifestyle, don’t fall into the trap of comparing your life with theirs. Stay true to yourself and your aspirations and goals in life and live your life to the best of your ability. Keep smiling, keep being positive and always remember we all have our own unique path in life.